Basic Information: What are Hairobics All-Natural Hair Vitamins? This review for Hairobics All-Natural Hair Vitamins will help inform and advise customers on whether or not to purchase this product. 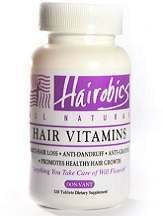 Hairobics vitamins are designed to promote healthy hair growth and decrease hair loss. Hairobics vitamins also claim to reduce dandruff and the graying of hair. Hairobics All-Natural Hair Vitamins are available online from their official website. Hairobics vitamins are made with a combination of all-natural vitamins, minerals, amino acids and essential nutrients. Customers should ingest two Hairobics vitamins twice daily, preferably with a meal. A bottle of Hairobics vitamins, containing 120 tablets, is available from their official website for a price of $24.99. The bottles ship at four ounces each. I have started taking the Hairobics vitamins for a little over three months now. So far, I am very satisfied with the results. My hair was thinning and falling out before I took these vitamins, but now, my hair has been growing back as thick and as full as before. The improvement was pleasantly surprising. However, I cannot vouch much, one way or another, for the other claims of this product about preventing dandruff and graying hair, as I have had no problems with either even before I started taking the product and still have no problem with dandruff and graying hair. The official website does not offer much in the way of medical information concerning their product. However, the vitamins are made up of all-natural ingredients, so adverse side-effects should not be too common. Customers should still not exceed the recommended dose. If any side-effects are observed, stop taking the product immediately and consult a doctor. If customers are not completely satisfied with their purchase, Hairobics allows customers to return their products within thirty days of purchase, minus shipping and handling costs. Customer reviews are available on their official website. Users can submit their own reviews to the site at any time. The reviews for this product on their official website are very positive and speak highly of the product. Hairobics All-Natural Vitamins are capsules designed to decrease hair loss, promote the growth of thicker hair, prevent dandruff and prevent the graying of hair. Hairobics vitamins are sold at a very cheap price, with a month’s supply costing only $24.99, compared to other hair regrowth products in the market. The vitamins also offer a less time-consuming treatment for hair loss compared to other topical products out there. However, their return policy could be better. I feel as though thirty days is not a long enough time window to return a product that might not even yield results until much later on. The product also has unclear usage instructions, as it only states to take two tablets daily. I have been taking one in the morning and one in the evening. However, a customer review states that he takes the both tablets at the same time in the morning. The instructions could be made clearer on how to make the product most effective.